- Provides a clear understanding of the most misunderstood aspect of motorcycle performance. 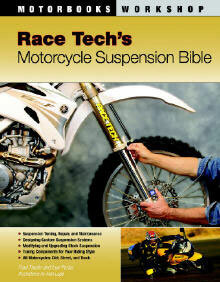 - Based on the highly successful Race Tech Suspension Seminars taught around the world. TNK manufacturers OEM quality replacement fork tubes for Street, Road Race, Sport, Sport Touring, Touring and Vintage motorcycles. They are made from the highest quality materials and generally significantly less expensive than original equipment. ►Click here for more info! 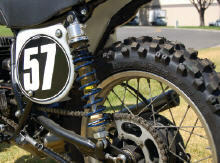 Early Husky forks, 35mm and 40mm have a common problem with the piston bands. 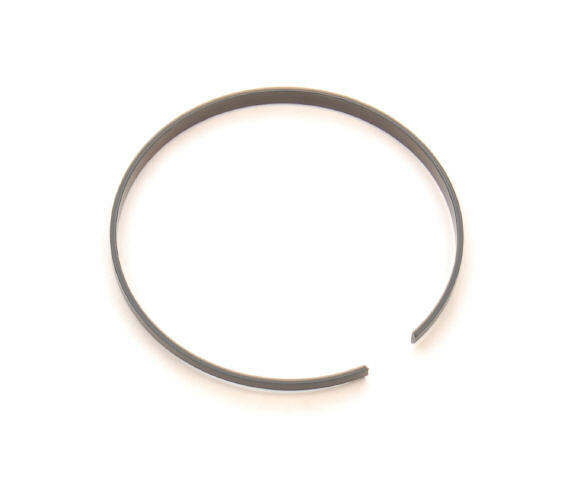 The stock Piston Bands usually wear out and are known to break. Since these parts are now obsolete from the factory we have produced a hi-performance replacement band for both the 35 (FPPR HQ35) and 40mm (FPPR HQ40) forks. *Note - On 35mm fork caps we have special copper washers (HMWC 3035) that seal perfectly. The stock 35mm forks don't have anything to seal them (plumbers tape doesn't really work well on straight threads). This is a really clean solution. RT Billet Dual-Chamber Fork Reservoir Pistons replace stock plastic pistons which have a tendancy for failure. 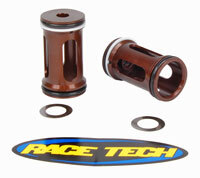 Allows removal of the stock shock piston without damaging the piston band on late model Suzuki Showa shocks. 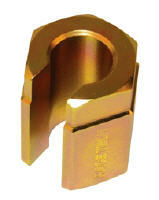 The tool fills the circlip groove allowing the piston to slide past without damage. The ►Gold Valve Shock Kit will transform your production shock into a Custom Tuned, High Performance Suspension Component. 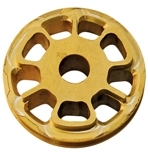 The Gold Valve allows us to set your shock for your weight, riding ability and type of riding. This will give you a factory ride for a fraction of the cost. "The Race Tech front end works awesome! You have so much more feeling with it. I can put the Race Tech front end anywhere I want it." 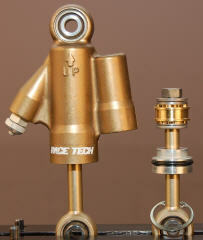 ►Cycle News - More about the Race Tech BPF Gold Valve Kits. TFCW 4549 - This wrench along with the TFCH 06 Seal Head Tool were designed specifically for the Showa BPFs (Big Piston Fork). 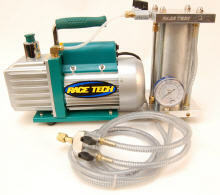 A "must have" for servicing 41 or 43mm BPF forks. 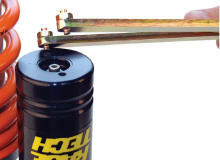 Designed to remove and install the seal head assembly from the inner fork tube in 41 and 43mm BPFs. It has both hex sizes. Allows changing fork springs without disassembling the valving stack. 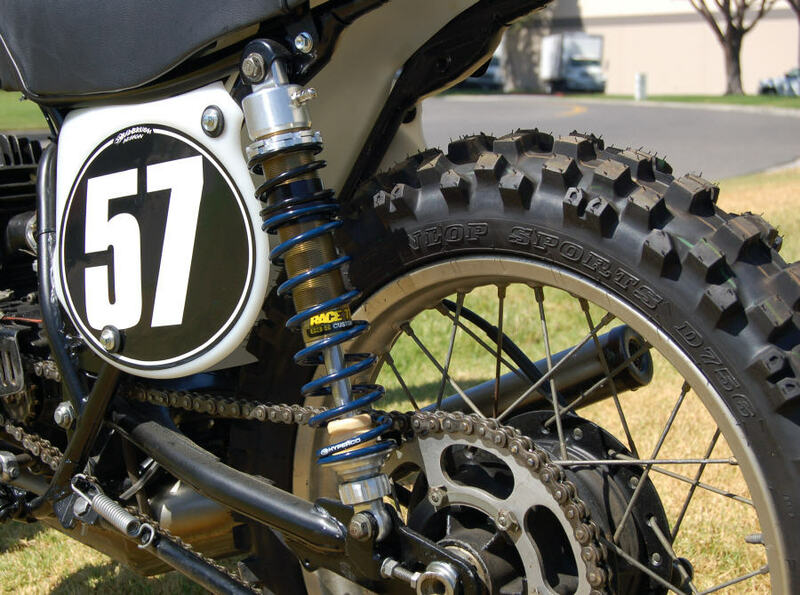 Race Tech is the place for Vintage Motorcycle Suspension. 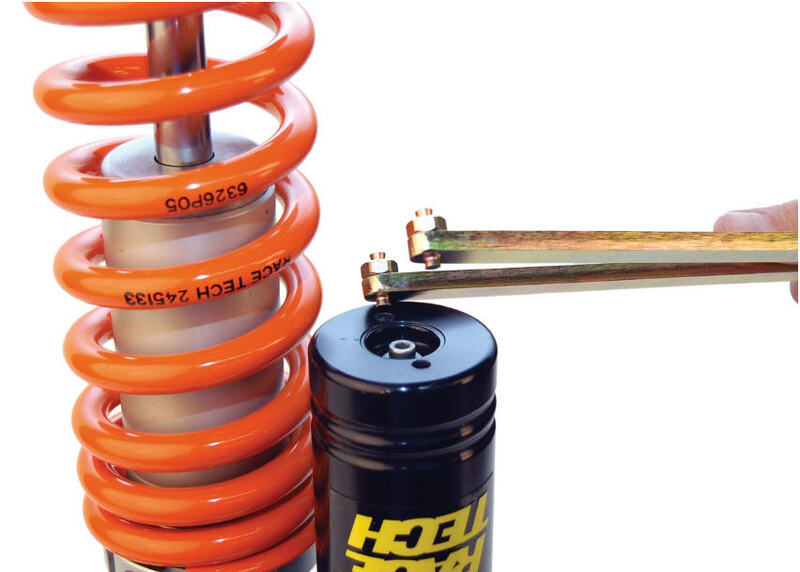 We have ►RT Hi-Performance Springs for fork and shocks, ►Emulators, ►Shock Gold Valve Conversions and ►G3-S Custom Shocks. 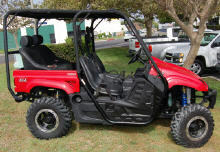 If you don't see an application for your bike please call us, 951-279-6655. RT Pin Spanners have a unique pin design with a reverse taper to keep them from popping out during assembly and disassembly.